Authors: Usama Qumsieh, MD, Marek Rudnicki, MD, PhD, Wendy Weller, PhD. Institutions: Metropolitan Group Hospitals/Univ. of Illinois Surgery Residency Program, Chicago, Illinois and Univ. at Albany School of Public Health. OBJECTIVE: Incisional hernias (IH) are observed in 10-15% of patients after open abdominal procedures and in less than 1% of patients after laparoscopic procedures. Given that the number of laparoscopic surgeries relative to open surgeries has increased over time, one would expect that the prevalence of IH among hospital discharges would decrease over time. 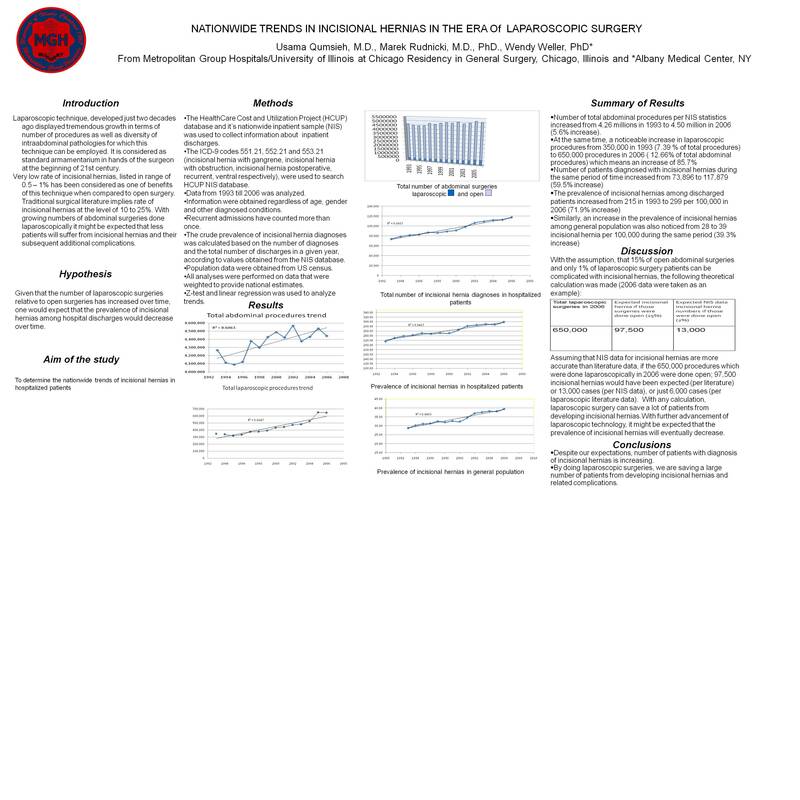 METHODOLOGY: The Nationwide Inpatient Sample from the Healthcare Cost and Utilization Project was analyzed using HCUPnet. Hospital discharges with a principal or secondary IH diagnosis (ICD-9 codes 551.21, 552.21 and 553.21) were included in the study. Similarly, all discharges with any procedure code identifying IH surgery (ICD-9 codes 53.51 and 53.61) were also included. The crude prevalence of IH diagnoses and IH surgeries were calculated based on the number of diagnoses and surgeries and the total discharges in a given year, according to values obtained from the NIS database. In addition, the total number of laparoscopic vs open abdominal procedures was queried as well. Annual changes in the number of IH diagnoses and procedures were calculated using the z-score. All analyses were performed on data that were weighted to provide national estimates. RESULTS: The laparoscopic component of abdominal surgery increased from 7.39% in 1993 to 12.66% in 2006 for the US hospitals. During the same period, there was an increase in the number of patients discharged with a diagnosis of IH (from 73,896 in 1993 to 117,879 in 2006). The prevalence of the IH diagnoses rose from 215.4/100,000 discharges to 298.8. 62,278 surgeries were performed for IH in 1993 vs. 100,948 in 2006 with steady annual increase and the prevalence rising from 184.4/100000 discharges in 1993 to 255.9 in 2006. CONCLUSIONS: Despite increasing trends in laparoscopic surgeries, the prevalence of IH does not seem to be in decline. Furthermore, the total number of surgeries done for IH is in rise as well.